Four Level Split just steps to the new high school. Very scenic 1 acre wooded lot with creek and ravine. Everything has been done for you, just move right in! 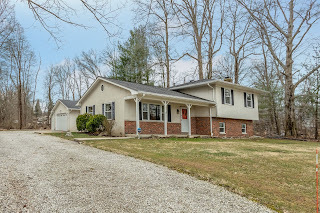 Updated furnace, central air, windows, interior paint, water heater, 200 amp electric service, flooring, some carpet, remodeled Kitchen, Baths & more! Spacious Living Room opens to the Dining Room with french doors to rear patio. Remodeled & fully applianced Kitchen has wrap around cherry cabinets. Owner’s Suite has remodeled shower Bath. Expansive Family Room has gorgeous stone fireplace & walks out to rear patio. Full Basement, partially finished. 2+ car garage plus a 12 X 14 yard building. 3 BRs & 2 Baths. Over 1,600 SF. Licking Heights Schools. Only $219,900! Call DeLena today!